Review: Confessions of a Sociopath by M.E. Thomas – What are you reading? 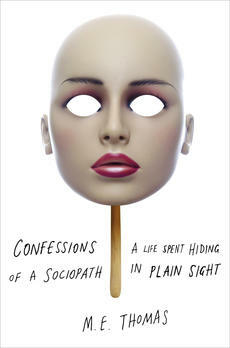 Confessions of a Sociopath delivers on its promise … it’s part memoir, part primer. It’s also morbidly fascinating. There is absolutely nothing redeeming about M.E. Thomas. By all social standards, she is deviant. However, she quite eloquently makes her case that is very capable for the sociopath to not be criminal in any way. M.E. Thomas’ voice is unrepentant and unapologetic, and in many ways, this is what makes the book so very readable. She never backs away from her initial premise that the sociopath is simply another group of individuals with a completely different manner of thinking and that not every sociopath is by definition violent and psychopathic. Some of the best moments in the book are when M.E. Thomas takes the time to run through the prevailing science and juxtapose it against her own life. I don’t believe anyone can read this book and not see someone they know in the prose, maybe even someone they’ve loved. Not everyone will be comfortable abolishing their sacred cows to the periphery to digest this book objectively, but if you can get past the societal programming we’ve all been fed, this is a fascinating read. DISCLAIMER: This reviewer received a free ARC in exchange for an honest review.